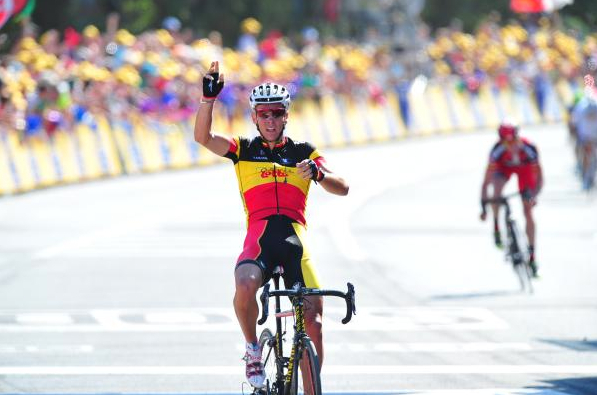 Gilbert dominates, Contador falls. Tour de France opens with several bangs. Home/Alberto Contador, Andy Schleck, BMC, Bradley Wiggins, Cadel Evans, Fabian Cancellara, Garmin, HTC-Highroad, Mark Cavendish, Omega Pharma Lotto, Radio Shack, Saxo Bank, Sky, Thor Hushovd, Tour de France, Tyler Farrar/Gilbert dominates, Contador falls. Tour de France opens with several bangs. 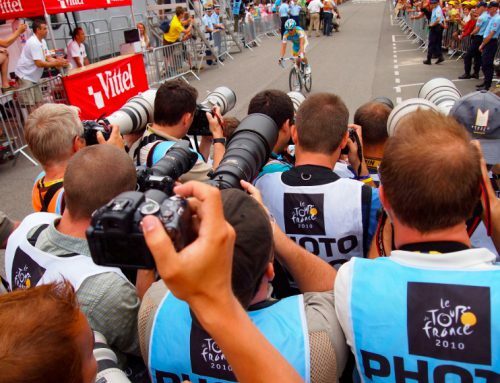 The 2011 Tour de France got off to a wild and dramatic start in the Vendee region. The first stage from Le Passage du Gois to Mont Les Alouettes Les Herbiers packed several punches, unexpected fireworks and surprises. Newly crowned Belgian champion Philippe Gilbert dominated on the uphill sprint finish and Alberto Contador was caught behind several crashes and already finds himself 1:14 behind GC rivals Cadel Evans, Jurgen Van Den Broeck and the Brothers Schleck. That was unforeseen and shocking — mostly for Alberto. The Spaniard was booed at the team presentation, then boxed and blocked on stage one. 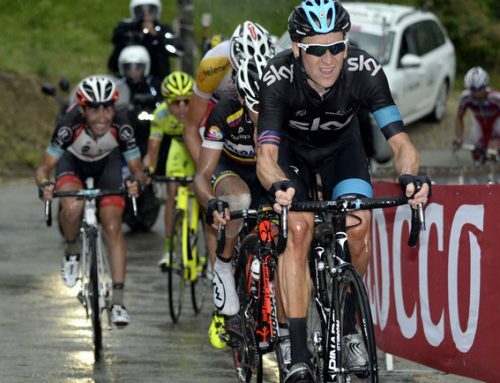 A bad start and a rough two days for a man attempting the uber-exhausting Giro-Tour double. He can thank his old Astana team for his misfortune today as Maxim Iglinskiy plowed into a clueless spectator and took down a huge pile of riders with 8.5 kilometers to race. The crash created the move of the day, a 35 rider front group with all the GC guns except Samuel Sanchez (Eusakatel-Eusaki) and Contador. The day had begun with a procession across the slippery Passage Du Gois where in 1999 Lance Armstrong took advantage of rival Alex Zulle getting caught up in a crash. It was deja screwed all over again and the Americans on Radio Shack did their best to make Contador pay. Levi Leipheimer and Chris Horner, along the Brothers Schleck and Cadel Evans all hammered as hard as they would go. Johan Bruyneel’s boys always ride at the front in the Tour, always. Contador appeared isolated and watched helplessly as the gap increased. When the TV press jumped Evans seconds after the finish, he was breathing so hard his voice went up an octave and we though he was actually going to cry. A strange one but the Australian has to be thrilled his grand depart. Last year’s Tour revelation Ryder Hesjedahl was also victimized by the big crash. Both he and Garmin-Cervelo’s other tour hopeful Christian Vande Velde lost 1:55. Vande Velde crashed out of the tour last year on stage three, this year his GC plans took a significant hit on opening day. The competition for the green jersey also began will all guns blazing. Rule changes mean the one and only intermediate sprint is essential for any sprinter in the hunt. It’s an exciting twist as now there are two full scale battles with flying trains. 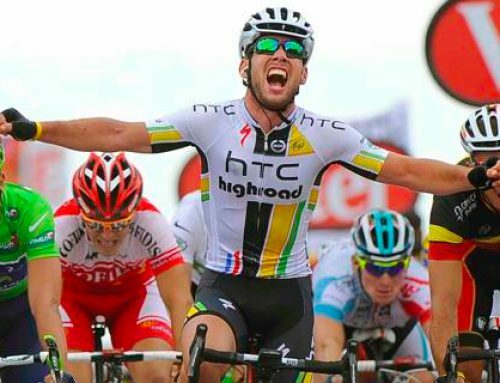 Cavendish’s HTC-Highroad squad lined it up along with Lampre and Omega Pharma but the winner was Tyler Farrar who went hard up the left side, appearing to catch the Manxman by surprise. A good start for the Garmin-Cervelo rider who has endured a rough season after the death of his best friend Wouter Wyelandt in the recent Giro. The day however belonged to Gilbert who seems to almost toy with opponents. He rides at the front joking, swings back to the team car for chats, acting like a man who owns the race. His team rode hard with even a bandaged Andre Greipel driving the pace. 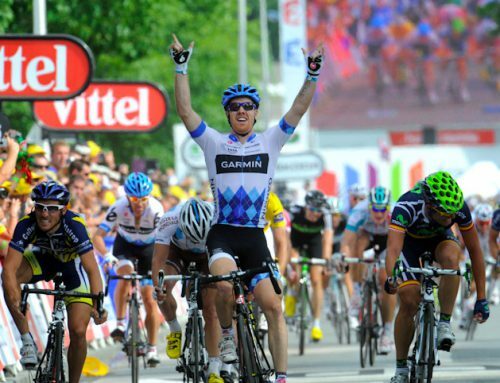 The German, finally riding his first Tour, must have been so excited that he crashed almost the second the stage started. Only Fabian Cancellara (Leopard-Trek) took a shot at beating Gilbert. With no prologue to show off his massive thighs and blazing speed, Cancellara launched with 600 meters to go. Only Gilbert reacted with force to close the short gap, and like Cavendish in the intermediate sprint, the Swiss champion lost interest and faded. I saw a list of results on CyclingNews: I THINK they had Cadel at 3 seconds back and Hushovd at 6 seconds. With the bunch behind also all given 6 seconds. It is interesting to look at the first list because it gives the strict order in which they finished. But the times given have "6 seconds" appearing sporadically almost all the way to the end of the list. Matt Goss was almost last, but was given 6 seconds. There was another crash within the last 3km, the riders involved in that got the same time as the Hushovd group. It was a spectacular stage, the yellow spectator is now expected to have more effect on the GC than the first eleven stages of the TdF!! This is bike racing, let's see what happens next. Complicated is another word for interesting, so it's gonna be good!